Want to know the value of your 1912 wheat cent? Some 1912 pennies are worth hundreds of dollars, while others are worth just 20 or 30 cents. If you’re curious how much your 1912 wheat penny is worth, then read on! How much is a 1912 penny worth? Are there any 1912 wheat penny errors to look for? How many 1912 wheat pennies were made? How can you tell if you have a rare 1912 Lincoln cent? What are some fun facts about 1912 pennies? If you’ve been looking for old wheat pennies in your pocket change, then you may have come across a 1912 wheat penny or two. Hopefully you did — because these old wheaties are worth a lot more than face value! 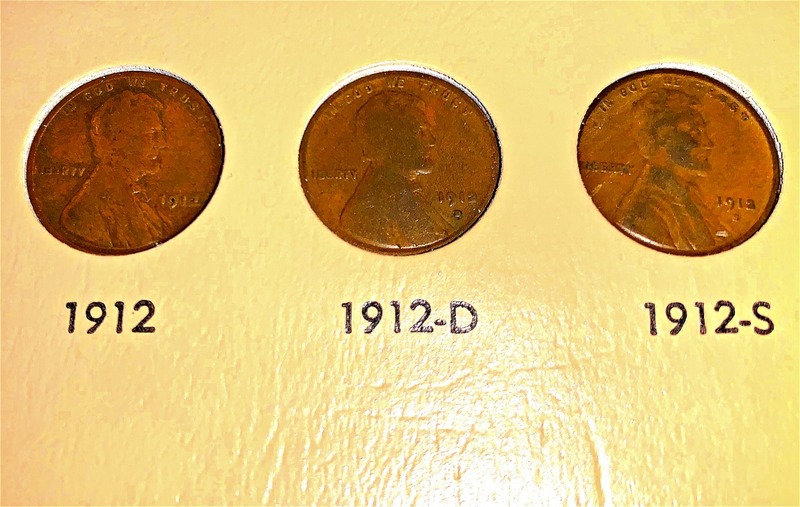 So… how much more than face value are 1912 pennies worth? Generally speaking, 1912 wheat cents range in value from about 20 cents to more than $500. Values depend largely on the condition of the coin, the absence or presence of a mintmark, and other factors — such as varieties and errors (more on that below). What’s a mintmark, you ask? Mintmarks indicate which U.S. Mint facility struck the coin. On old Lincoln pennies, mintmarks can be found under the date on the obverse (heads side). In the case of a 1912 Lincoln cent, no mintmark means it was struck at the Philadelphia Mint. A 1912 penny from the Philadelphia Mint has a value ranging from approximately 20 cents in well-worn grades to about $35 in average uncirculated condition. A 1912-D penny (from the Denver Mint) is scarcer than a 1912 penny from the Philly Mint. These pennies range in value from about $4 in lower circulated grades to more than $150 if uncirculated. A 1912-S penny is the scarcest of the business-strike Lincoln cents made for circulation. It’s worth approximately $10 in well-worn grades to more than $200 in uncirculated condition. 1912 proof pennies, which were struck at the Philadelphia Mint for coin collectors, exhibit sharp strikes and matte surfaces. They’re worth about $300 or more. *Values are for 1912 Lincoln cents with no signs of damage, including cleanings, holes, bends, heavy nicks, or other types of problems. Are There Any 1912 Wheat Penny Errors? Some 1912 Lincoln cents are worth a ton of money. Specifically, 1912 wheat pennies with errors or die varieties! A lot of people have been searching for 1912 doubled die pennies. NOTE: Some people say, ‘double die’ pennies. However, the correct term is doubled die — because the image on the die striking the coin has been doubled. So, there is no such thing as a 1912 ‘double die’ penny. Yes, it’s possible that some rare and valuable 1912 doubled die pennies may have been struck. However, at this time no significant 1912 doubled die penny varieties have been reported or catalogued. This doesn’t mean there are no 1912 doubled die Lincoln cents — so you should definitely keep looking for 1912 doubled die wheat cents. 1912 pennies with a repunched mintmark error — Some 1912 pennies have been found with the “S” mintmark repunched at least twice. This resulted in what appears to be a doubled “S” mintmark. Not many pieces have been found — so pricing information is scarce. However, similar repunched mintmark pennies have sold for anywhere from $5 to more than $25. 1912 off-center pennies — Nobody’s perfect, including the United States Mint! Some 1912 pennies were struck off center, leaving these coins with tiny blank crescents and others with much larger areas of the coin blank. Values for off-center 1912 wheat pennies range from $5 to $10 for pieces missing only a small percentage of the design (about 5% to 10% off center) to hundreds of dollars for 1912 pennies that are missing 50% or more of the design but with the date still intact. 1912 wheat pennies with die cracks and die cuds — As the dies that strike coins wear with age and use, sometimes they begin breaking down. This can leave small cracks and pits in the die that transfer a relief (raised) crack, mound, or other oddity on the surface of the coin. Values for die chips, die breaks, and die cuds vary depending on the size and location of the crack. Some 1912 pennies with major die cuds can be worth over $100, while tiny die cracks and die chips may add only a very small premium of $1 to $2 to the overall value of the coin. There are many other types of errors to look for on 1912 pennies — including die caps, brockages, and other errors. The best way to spot an error coin is to carefully check all of your 1912 Lincoln cents for anything unusual and report odd findings here in the comment section at The Fun Times Guide to Coins! 1912 pennies have some cool history behind them! The 1912 Lincoln cent was designed by Victor David Brenner, who designed the Lincoln penny in 1909. Brenner’s initials, “VDB,” are seen on the reverse (tails side) of some 1909 pennies. However, the VDB was removed soon after the first 1909 pennies were minted — because some people felt his initials were too large. In 1918, Brenner’s VDB initials were restored to a spot just below Lincoln’s shoulder on the obverse (heads side). The wheat stalks on the 1912 penny symbolize national prosperity. The wheat ears were incorporated into the design of Lincoln pennies from 1909 through 1958. Wheat pennies were replaced in 1959 by Lincoln Memorial pennies. What Else Happened When Your 1912 Wheat Penny Was Made? Upon the maiden voyage of the Titanic, the “unsinkable” ship collided with an iceberg in the North Atlantic Ocean — causing the drowning deaths of more than 1,500 people. Woodrow Wilson and James Sherman were respectively elected president and vice-president of the United States. New Mexico and Arizona were admitted to the Union as the 47th and 48th states. William Randolph Hearst began building a media empire that eventually included nearly 20 newspapers and 9 magazines. Girl Scouts of America was founded by Juliette Gordon Low and quickly became one of the most popular youth organizations for girls in the United States. German meteorologist Alfred Wegener proposed the theory of continental drift, or the gradual movement of continents across the globe over time.